After enjoying our initial game of Blücher, I decided time was right to dip my toes in the murky waters of Napoleonic gaming. With Blücher being such a high level of organisation from a gaming point of view, I wanted something to go with the epic scale of the game and decided on 6mm. My local manufacturer, Baccus turn out some amazing figures in this scale, this was my obvious first port of call. I ordered a set of British line infantry, the cheapest they had, and the duly arrived. They are brilliant little sculpts, really full of detail and they far exceeded my expectations. 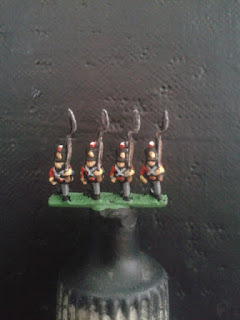 Now, I haven't painted 6mm figures for many, many years and although Baccus have a 'how to paint 6mm' guide on their website, it is aimed at Marlburian figures, so I searched around for a Napoleonic guide and found this brilliant blog post. It was exactly what I needed to start. I was surprised at how quickly I was able to paint these four (about twenty minutes in total), now, I just have to finish the other 92 figures in the set... 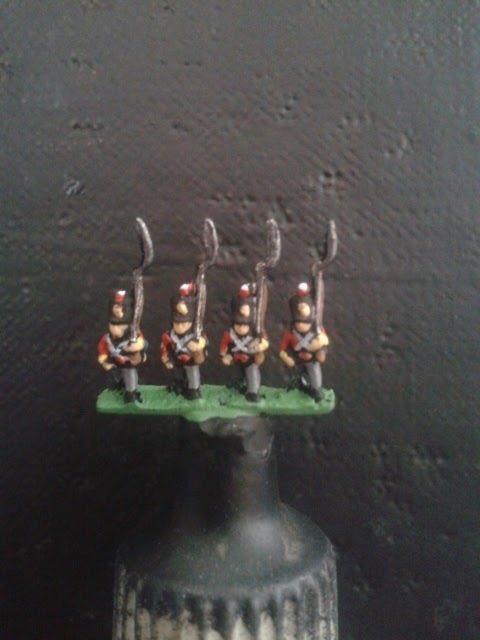 I am pretty pleased with them, but as they are my first Napoleonic figures for a couple of decades I welcome any comments on the schemes, details or other bits and pieces. 2018 edit: Since writing this post several years ago I have painted a large amount of 6mm figures based on the armies in the 100 Days Campaign of 1815, please click HERE to see the individual posts, I hope you like them! These look great, although my eyes hurt just thinking about painting them! Thank you! I just hold them very close to my face and try not to breath! 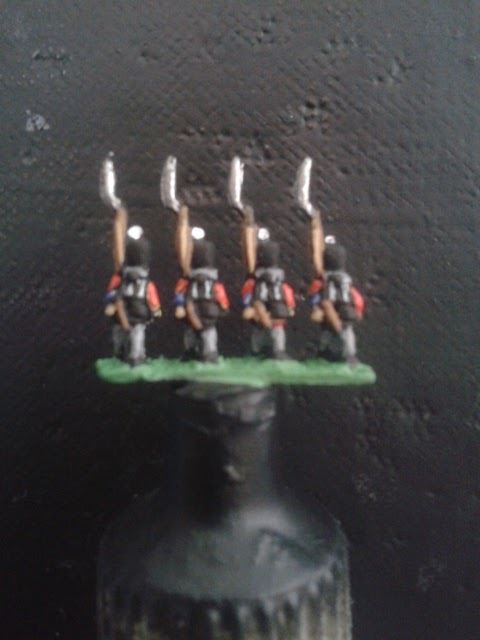 Now you've got your eye for 6mm back in, you'll probably want to do the rest in slightly larger groups to help keep them more uniform (and to not waste paint!). Thank you very much, yes, I was going to treat the strip of four men as a single figure and paint quite a few at once. This one was simply a test, plus I have been really rushed this weekend with my fiancée's birthday, so I only had twenty minutes to sit down and paint. You show off!! 15mm and now 6mm. My poor old eyes would never forgive me. Ha ha, thanks Russ, I just hold them really close to my face when painting them! Very nicely done! I've never thought about Napoleonics in this scale, I have some Micro-Armour and Battletech is also in this scale. Thank you! The last 6mm I painted were either GW Epic or Heroics and Ross WW2 micro armour. But it was a long time ago for both. I think 6mm works really well for the Blucher scale game. 15mm or bigger wouldn't look epic enough, I think! Yes, you should get a really good "look" out of these, near-scale. I'd almost forgotten Epic Space Marine, I have loads of Imperials for that. I have a French DCR for WW2 and some odds & ends for Cold War. I used to have an Imperial Guard army, but that was back when I was a teenager. I bought my stuffs in my 20s, Titans and Space Marines, mostly. Very nice work. The Baccus figs are great. I have painted thousands of the little blighters, get a production line going, you will be through them all in no time! Out of interest what base size are you going for for Blucher? Ive gone for 80mm - 60mm. Quite big but more epic looking I think! Thank you, yes, they really are. I envisage myself buying quite a few of the little fellas as well. I am going to treat eat four figure strip as a single larger scale figure and paint several strips at a go. I am going to stick with the size of the cards, about 3 1/2 inch wide, by about 2 inch deep. Sally Fourth do pre-cut MDF bases of this size, so this is what I'll be using. Nice, very nice...a fantastic job in this scale! Thank Phil, the brilliant detail on the Baccus figures really helps! 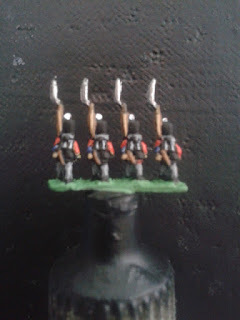 My 6mm chaps are usually on 30mm wide bases which I have generally found works for most things. I paint them in batches of a couple of hundred at a time. The production line method really speeds things up, and in this scale drybrushing is your friend.